J. Herbert Dahm: Margaret B. and John R. Zehner Award for contributions to the county's history and for underscoring the value of historic preservation to the community. All of the awards made by the Society in 2014 underline the positive effects of preservation on the community. For example, in one instance, the excellent restoration of a house threatened by demolition maintained the integrity of a Piermont Historic District. In another, a Haverstraw family business operating out of the same 19th century building since its inception, contributes positively to the village’s rich history, and in another, a municipal restoration of a public space anchors a well-traveled Clarkstown Crossroad, inspiring passers-by. Please join us in congratulating the award recipients. 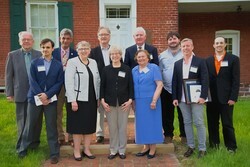 For information on attending the awards ceremony and country supper, which will be held on the grounds of the Jacob Blauvelt house on May 18, 2014, click here. Since 1991, the Historical Society of Rockland County has presented over 65 awards to public agencies, private individuals, community-based and religious organizations in recognition of their preservation efforts in the County. The Committee also supports continued, critical action to help save Rockland County's environmentally sensitive areas and endangered architecture. Instituted to preserve the rich historical heritage of the County, the annual program celebrates each May with a declaration of "Rockland County Preservation Week" by the County Executive, a festive country supper and awards ceremony. The awards, made by the Society for preservation efforts on homes, businesses, municipal locations, and structures both modest and grand, help to get out the word that it is in everyone's interest to restore and retain the richness of the past. The process is self-fulfilling, and it helps to unify and inspire a community. For more information on the award process, or to find out how to attend the Country Supper contact the Historical Society of Rockland County at 845-634-9629 or info@rocklandhistory.org.